I skipped moisturizer for a long time before I actually realised its importance. I found out Hada Labo SHA Hydrating Lotion(old formula) by chance. I was googling products that could plump up my pitted chicken pox scars when I chanced upon Sara's post on it. Immediately went to the nearest Watsons and purchased it. From then on, it was love at first pat. I actually repurchased a bottle recently and only realised the new formulation when I was sent another. 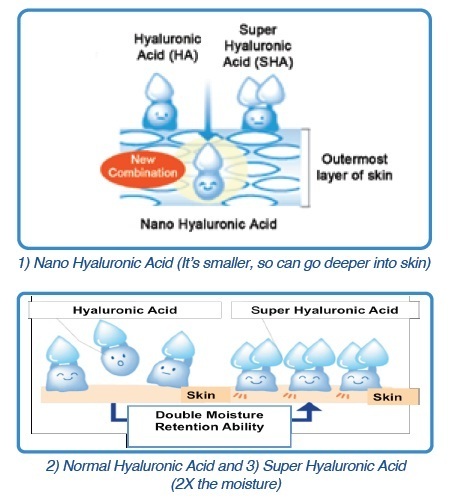 The new 'Nano' hyaluronic acid molecule is 1/20 the size of the normal hyaluronic acid's. This simply means that it is able to penetrate to areas deep within the skin. The other two hyaluronic acid, 'Normal' and 'Super' hydrates skin closer to the surface. A diagram representation of what I meant above. 2 drops really is all that you need to wake up with super supple skin. My skin used to feel dry and tight because of my excessive cleansing(remember?). Now it feels supple and bouncy. This is super suitable for Singapore weather. It's super light you won't feel it on your skin. If you follow me on twitter, you know I rant about my super dark eye rings. I haven't had my proper 8 hours of rest and I look like a living dead everyday. This product was a god sent. I was most excited to see how it fares next to my favourite product from the same line. I stayed away from eye creams most of the time because of how thick and creamy it feels. It usually feels oily and I would wash it off almost immediately. This however, feels super light! Pat it for a few seconds and it is almost immediately absorbed. I love this cream and will definitely repurchase. I will update you if my eyes will be rid of dark circles anytime soon. But I am sure that this product will work wonders if paired with 8 hours of sleep. The Hada Labo Super Hyaluronic Acid Eye Cream (15g) is available at all Watsons nationwide at $21.90. Head over to Hada Labo's facebook page to redeem your own sample of Hada Labo SHA Hydrating Lotion! And LMAO at "I haven't had my proper 8 hours of rest and I look like a living dead everyday." I swear i feel the same way, but i love your honestly and rawness! Hehe I am glad you found my blog! Thank you for visiting! Did it help heal your pitted chicken pox scars ? My scars are much more softer now. It will not be smooth entirely unless I fill it, which I won't. So I believe this helps a lot. My scars were more prominent a year ago before I started using Hada Labo. Get your free sample by going to their facebook! Link above!